BANGI, 16 Nov. 2010 – Sleeping on the five foot path while collecting discarded boxes to be sold to buy food for the day – is not a sad short story but the real life of a vagrant in Kuala Lumpur. 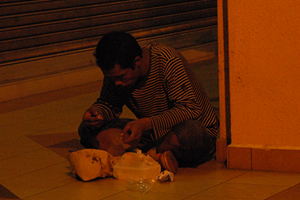 The sufferings of this man from Sabah came to light when he came to collect food packages distributed by Pertiwi Soup Kitchen at one of the streets near Medan Tuanku Abdul Rahman in the Federal Capital recently. “He man came to Kuala Lumpur from Sabah nine years ago full of hope but had not been able to get a proper job and had lived a vagrant’s life since. He was only able to collect disused boxes to be sold to buy food and sleep in the five foot path every night. “He refused to go back to Sabah as he said life in his home town is much harder,” said Prof Rohany who was involved as a volunteer helping Pertiwi Soup Kitchen since last June. The package of food which usually consists of rice with gravy, egg and a slice of fruit cost RM4 each is handled by Pertiwi Soup Kitchen run by Puan Munirah Abdul Hamid. 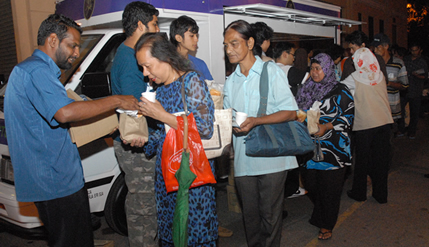 The food package with a drink is distributed every Monday, Wednesday, Friday and Sunday. Prof Rohany said “we can understand their sufferings only after meeting, talking and mixing around with them. They usually slept on the five foot paths, under the bridges or at bus stations in the city centre”. In an effort to make UKM students more aware of the sufferings of vagrants and the reasons for their predicaments, Prof Rohany encourages her postgraduates students taking up Psychology Counselling to become volunteers for Pertiwi Soup Kitchen. For some of them the programme is their first experience in doing welfare work while others have been involved in helping flood victims, poor students and other social activities. Prof Rohany, who have been involved in social work for a long time said: “Only after we get ourselves involved do we really know the real life and sufferings of this group of unfortunate people whom we normally take for granted. Prof Rohany who was involved in helping flood victims since her school days in the 60’s in Kelantan said we could not understand and may not know the sub-cultures of other people until we mix with them. “Until then we can only assume that their values are the same as ours when in fact they are entirely different. I am sure after meeting and helping the vagrants my postgraduate students will be more sympathetic towards them,” she said. The Faculty of Social Science and Humanities have recently set up its Graduate Social Club to get more students to participate and be involved in outreach activities. President of the Club, Major Mohamed Rosly Darasid, 41, said it also helped students and lecturers overcome some of their problems as well as organising social functions. One of their outreach programmes is becoming volunteers for the Pertiwi Soup Kitchen. One of the volunteers, Muhammad Adnan Abdullah, 45, who hopes to finish his study within a few months have been involved in social work since 2003 when he helped poor students and Muslim coverts in his village in Kuala Pilah. He went to help the Pertiwi Soup Kitchen run by Puan Munirah Abdul Hamid, together with other students including Rabiah Abd Latif, 23, Hafizah Azlan, 25 Lim Hooi Shan, 23; Norizan Hassan, 24, Sharifah Azliza Syed Alwi, 25, and Chang Wei Hsien, 24. Adnan who is pursuing his Master’s degree said his involvement helped to improve his knowledge and work at Yayasan Kasih Sayang Negeri Sembilan. A businessman, he hopes to duplicate the work of Pertiwi Soup Kitchen to help wayward youths in his village. “Distributing food may be the first step before we can get to know and understand the needs of such youths to be able to guide them later,” he said.